Combine sightseeing, swimming and snorkeling on this private day trip by speedboat from Split. Your personal guide leads you on a tour of the UNESCO-listed city of Trogir. 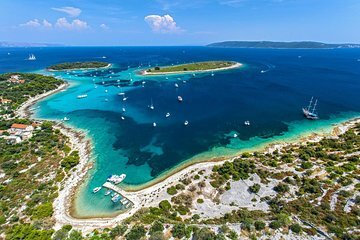 Explore pristine beaches and hidden coves, including a stop at the Blue Lagoon off Drevnik island. Enjoy drinks on board and go wine tasting in a quaint fishing village on Brač. You’ll also visit the islands of Čiovo, Maslinica and Šolta as you cruise across the shimmering waters of the Adriatic Sea. Outstanding trip. Beautiful comfortable modern boat. The captain and guide were both exceptional!